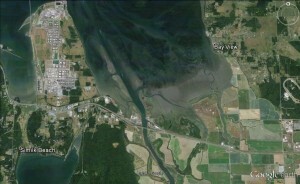 A local insurance professional once stated that the southern entrance to the Swinomish Channel is, year after year, the site of a lot of claims resulting from grounding. Experienced mariners know better than to “cut” any of the buoys here. A range in Dugwalla Bay, to the west, is defined by marker boards with red backgrounds and white stripes. When the stripe on the more forward of the two boards appears to be in line with the stripe on the board farther to the west, a vessel is aligned with the center of the channel. It isn’t difficult to get started up the channel without going aground, just isn’t difficult for an unlucky boater unaware of local conditions to make the close acquaintance of a mud bank in this location. When entering the Swinomish, proceed slowly, watch the depth sounder, keep an eye on the Dugwalla Bay range, and make sure to round every last buoy. The proper turn into the channel is almost a 90-degree affair. Boaters approaching the end of the channel with a long, casual angle may have missed the final buoy. Boaters bound for the San Juans from the central sound will pass Goat Island and a booming ground, (both off the starboard beam), before arriving at an “S” turn along a rocky cliff. Some old charts list the passage as “Hole in the Wall”, although that name is more commonly associated with a channel near the Octopus Islands in British Columbia. Be cognizant that there may be some speedy boat blasting through the passage and that the skipper will be unable to see you around the corner until the last few seconds. Once past the S turn, the Swinomish route passes the Shelter Bay community. Recent dredging has removed a mud hump that tends to form off the southern most house in the Shelter Bay development, but it pays to watch the sounder very carefully when passing Shelter Bay. Currents can run several knots in the Swinomish, but unlike Deception Pass the primary concern with current here is its effect on the speed of a vessel. Picking up a few knots of “push” can be very useful for an 8-knot trawler, but should the same 3-knot current be running the wrong direction instead of speeding along at 11 knots a trawler might be slowed to 5. Observe the No Wake Zone off the town of LaConner. Many boaters bound for the islands will overnight at LaConner, (highly recommended). If the current is running at all, be sure to approach the guest docks when headed “upstream”- even if that means going beyond an available space on the dock and turning around to return. The channel north of LaConner is adequately marked, but a chart and or plotter will be essential to ensure passage on the safe side of all buoys. At a couple of bends along the route, it would be easy to assume that the channel continues where the channel does not. 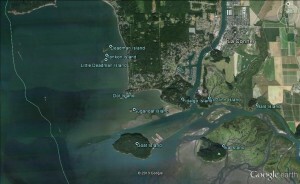 Once past Twin Bridges Marina and the railroad bridge, the channel continues through Padilla Bay to Anacortes. Again, don’t be fooled by what appears to be a vast area of open water to the east of the channel. The safe channel is found only between the marker buoys, as a passage through here at a low tide will dramatically reveal.